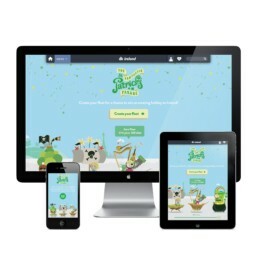 Our brief was simple: to turn excitement around St. Patrick’s Day into measurable engagement and returns. Insight shows interest in Ireland peaks just after March 17th, so we needed to create lasting publicity instead of just a big splash on the day. Tourism Ireland has the second largest Facebook presence for a tourist board, so it made sense to make this the heart of our campaign. Oh and we won some awards as well, check out the case study I put together to learn more. about how we got tourists in the mood for a trip to Ireland. The first step was to animate Tim Bradford’s beautiful illustrations. The only obstacle was that in order to play nice with the devs, it had to be done in Flash. So I took the team under my wing as we dusted off our copies and got to work bringing to life the many floats and characters. Our virtual parade rolled by to a backdrop of Ireland’s most loved tourist attractions. 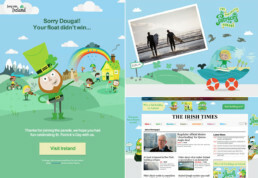 We drew on people’s unique floats to direct them to areas on Ireland.com that match their interests, using the initial excitement of St. Patrick’s Day to bring everyone closer to Ireland.